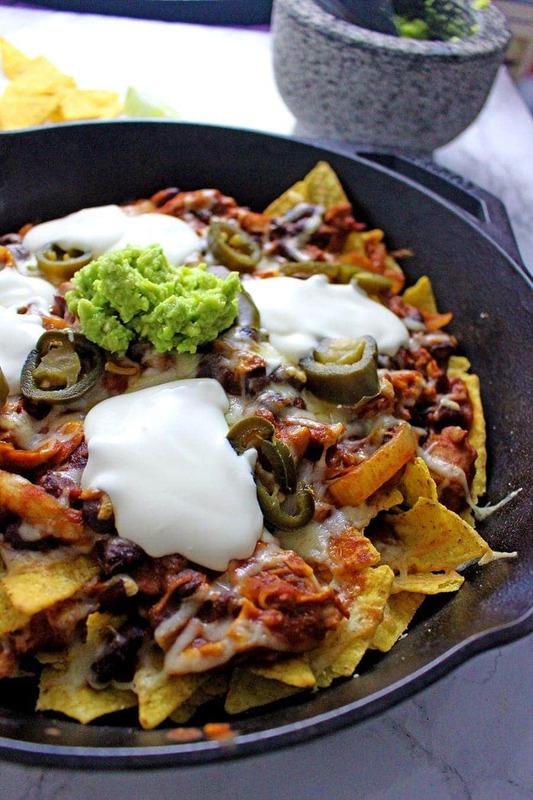 These chicken chili nachos are a perfect party dish! Surprisingly quick to put together, you can make them even easier by using pre-cooked chicken. Who doesn’t love nachos? 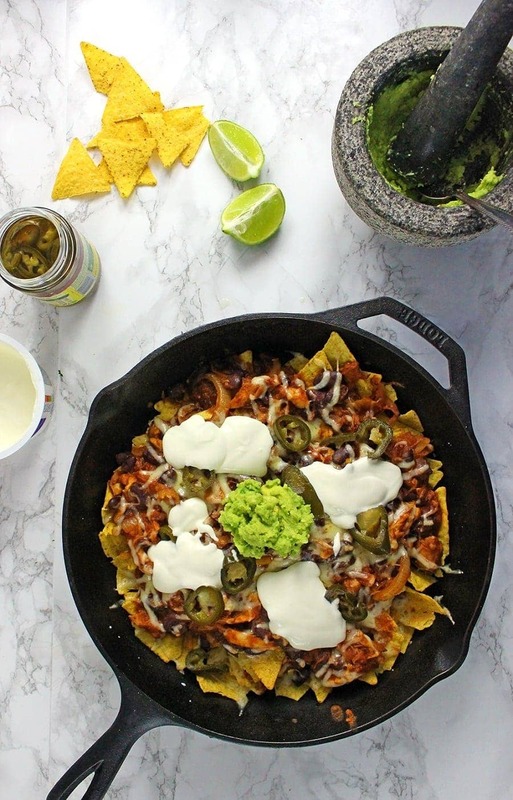 They are my ultimate comfort food in any shape or form and these chicken chili nachos are so full of mexican flavour, topped with all the traditional nacho accompaniments, they’re soooo good! So I think I’ve mentioned before that I finish work at lunchtime on a Friday which is as lovely as it sounds. Will is freelancing at the moment so he’s at home all day anyways and as soon as I get out of work I rush home to see Will and celebrate nacho Friday! Nacho Friday is the best day of the week. I get home at 2, we make nachos and eat them in front of the TV. Then we both get on with work in comfortable, companionable quiet. Sometimes our nachos are just plain old salsa, sour cream and cheese which is still excellent because nachos are always excellent and sometimes we do something a bit more exciting like leftover chili. Last week I didn’t make it home for nacho Friday and to make up for it we needed to do something extra special on our one time only nacho Saturday and so these chicken chili nachos came into being. Now you might be thinking these chicken chili nachos would take far too long than is acceptable to wait for nachos on account of having to make chicken chili. But you’d be wrong! In fact, if you have ready cooked chicken the whole thing takes about half an hour. 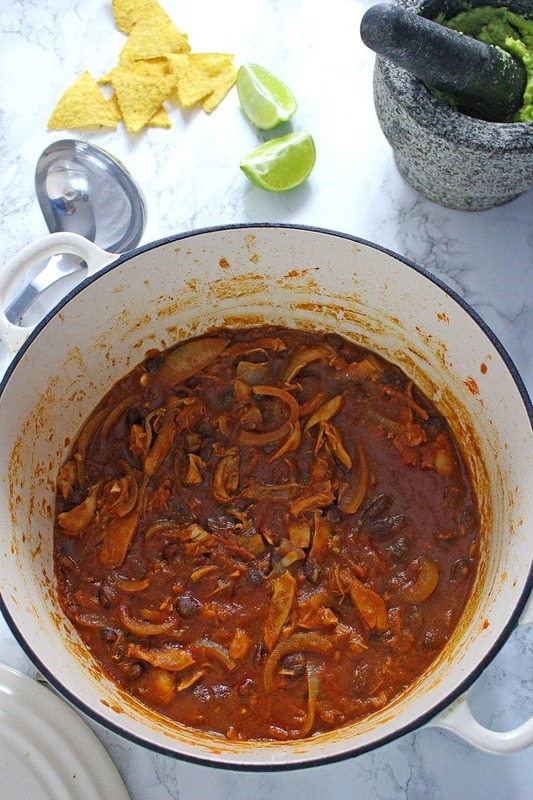 Once you’ve thrown the chili ingredients in a pot you can just put together your guacamole and get your tortilla chips ready for your toppings. What’s your favourite nacho topping? I love sour cream more than is probably normal so that has to be on any nachos I’m going to eat. Will likes jalapenos so they’re always on there too. Finally, we had guacamole which I had to eat around because I still haven’t gotten over my hatred of avocados. Trust me, I’m working on it. Tortilla Chips I haven't put a quantity because this kind of depends on how many nachos you want! Just get a bag and go crazy! Preheat the oven to 200°Heat a little oil over a medium heat and saute the onion and garlic until soft and translucent. Add the spices, chopped tomatoes, tomato puree and sugar and simmer for 2 minutes. Add the chicken, beans and stock and bring to a boil. Simmer for 10 minutes until the sauce has thickened. Lay half the tortilla chips on the bottom of an oven proof tray or cast iron skillet. Spoon some of the chili over the chips followed by half the cheese. Add another layer of tortilla chips (the double layering is VITAL for good nachofollowed by the rest of chili and cheese. Place in the oven just until the cheese has melted. Serve topped with sour cream, jalapenos, and guacamole. WONDERING WHAT TO DO WITH THE LEFTOVER INGREDIENTS YOU’VE GOT FROM MAKING THese chicken chili nachos? 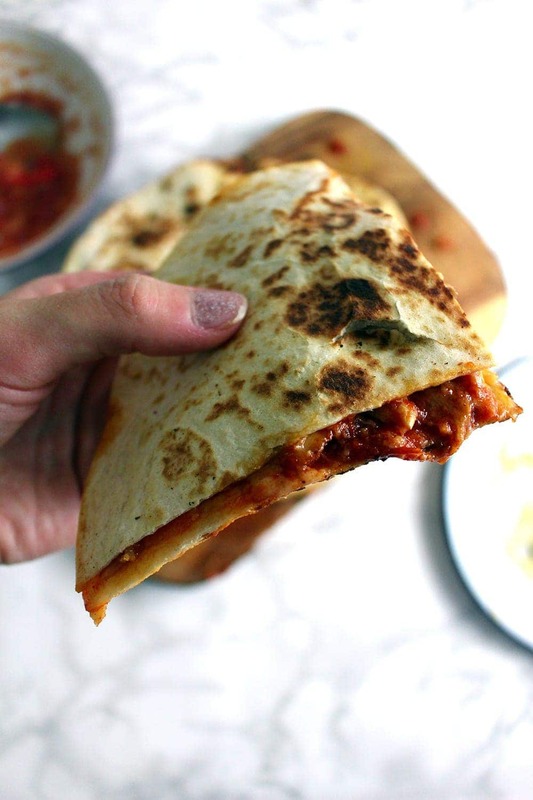 Use up your sour cream with these chipotle chicken quesadillas! 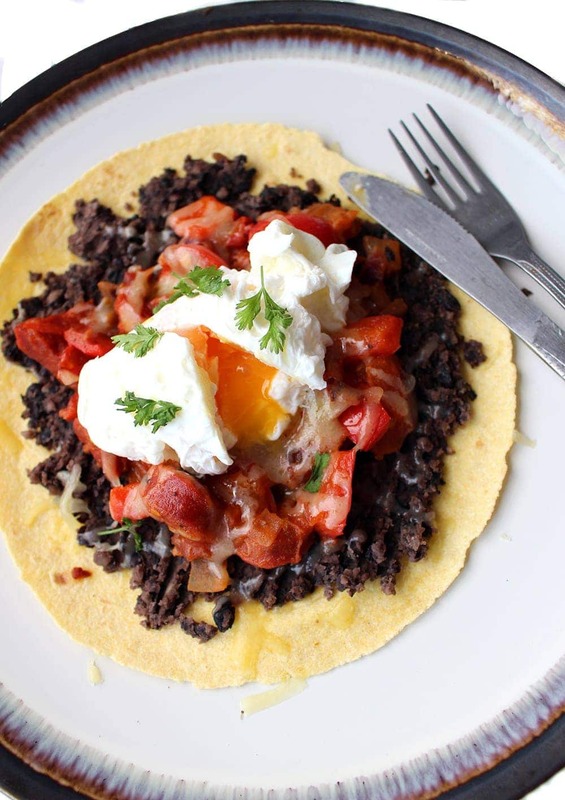 Sprinkle cheddar over this chorizo huevos rancheros. 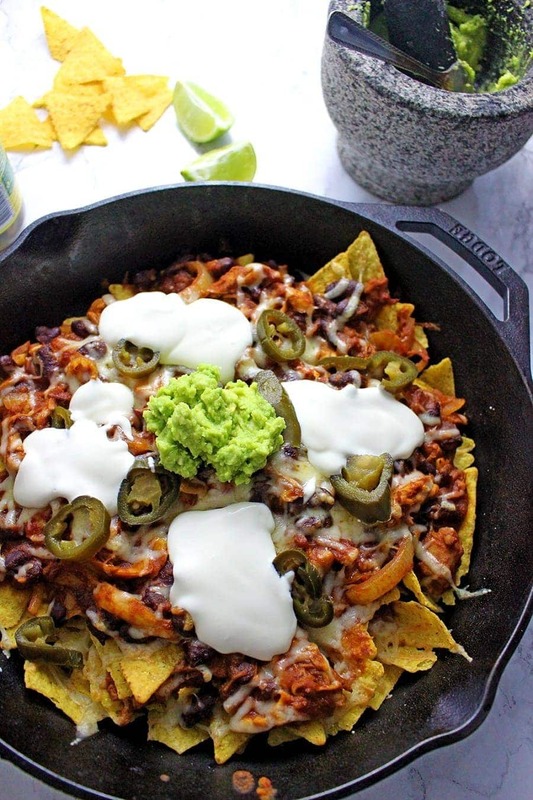 These look soooo delicious because I absolutely love nachos but I love that you included what to do with the leftovers.. quesadillas are the best!! Yum!!! This looks amazing!! YUMMY!!! I am loving the sound of these. I’d have them from breakfast, lunch or dinner! YUM! So many good flavors in this dish. Perfect for football party season too! 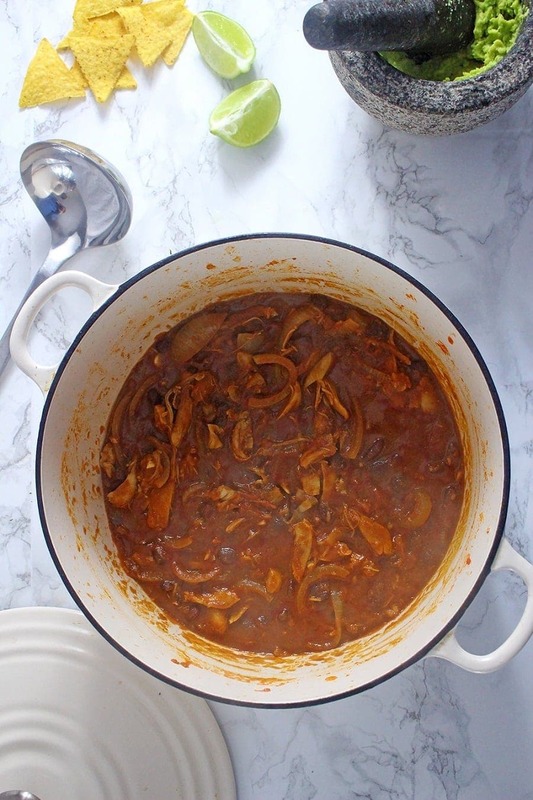 This is the perfect game day recipe! I definitely need to make this!